All eligible participants will be entered in a draw and a winner will be drawn during a public San Diego GCSA meeting during 2019. All you have to do is trial Nualgi Foliar for 4 apps at $0.00. Review your trial after 40 days using Nualgi on your greens and be in for a chance to win! It’s that easy! Nualgi will have the right to use the submitted reviews and photographs provided for marketing purposes. Applicant will be tagged or credited in Nualgi marketing on our website, social media and advertising and in any marketing materials. A draw will take place at the San Diego GCSA Meeting. Nualgi will draw one winner for every 500 valid entries. This winner will be removed from the draw and notified by Nualgi. All other eligible entries will participate in the next draw. Last draw will be held on Nov 1, 2019. Winner does not need to be present to claim the prize. An applicant may return the 4 x 500ml bottles of Nualgi to Nualgi America, Inc, 100E San Marcos Blvd, Suite 400, San Marcos. However, the applicant may not sell or transfer the product to another person or entity. The winner of the prize is eligible to select their 3 day 4 round golf package for 2 from the Whistling Straits Dye-Abolical Package ; choosing a course and accommodation up to a maximum budget of $1,800 per person. Transportation to and from the destination will be included up to a maximum budget of $500 per person. Daily breakfast and box lunch per person will be provided during the 3 day 4 round stay, up to the maximum budget of $200 per person. Total prize value $5000 for 2 players. Prize is non-transferable and non-redeemable for cash or sale. Prize must be redeemed within 18 months of winning date. “We trialed Nualgi on all 18 greens (2.8 acres) on Aug 18 2018 and added it to our weekly primo spray on greens. On Aug 21 we started to see a green up from the spray but never got a surge growth which was good. Some of our thin areas on cleanup passes showed signs of recovery and we got similar results that we get from our micronutrient spot sprays in weak areas. We were happy with the results we got on greens. All in all we were very pleased with the results we got from Nualgi trails and we were most impressed with its disease suppression (preventatively) against dollar spot which is the most common fungal disease for plantation paspalum. 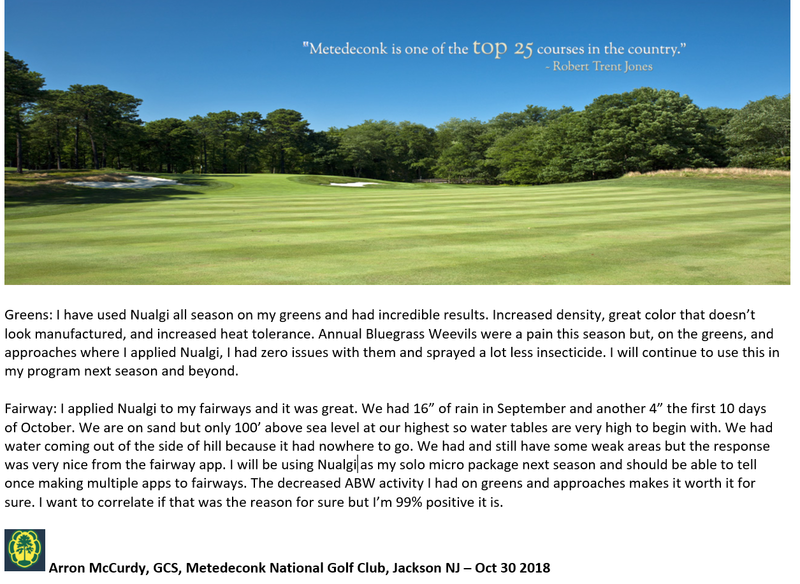 The cost effective price per acre along with the results we saw from the trials make Nualgi a very exciting new product for the golf industry.